This a photo taken in 1941 of the boys of the Junior Training Corp. It was taken in the grounds of St Andrew’s Church, South Moulsecoomb, after Sunday church parade. Sitting centre with the Padre, is Mr Bean our Captain, who lived in Barcombe Road. Most of us were then about ten or eleven, some a little older, and all, I think went to Moulsecoomb Senior Boys School. That’s me back row far right, the one with the scruffy hair. It would be nice to know the whereabouts of any of the boys. We used to gather in St. George’s Hall in Newick Road, North Moulsecoomb. I lived at 144 Newick Road, directly opposite the hall. There was also a group for older boys called The Church Lads Brigade, my brother Peter was in that with his pals. All in all, considering we were in the middle of a war, a great sense of friendship and fun was had by all. Hi Roy I keep looking at the picture to see if I can see my Dad. Right age group right area etc. One face keeps looking like him. Can I e mail you his name to see if it rings any bells? Hi Roy. 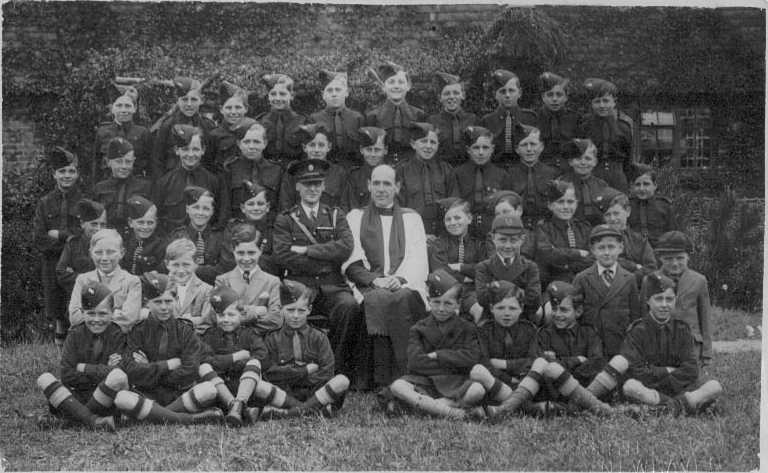 The Captain, Mr Bean, was my Granddad and I think that the boy sitting two to his left is his son, my uncle, Les Bean. I’ve got a lot of brass badges and buttons for the uniforms but they say CLB which I thought stood for Church Lads Brigade? Hi Martyn. Thanks for your comments – yes, you are right, Les (2 to the left of Mr Bean). Les’ next door neighbour in Barcome Road were the Souths, and the lad almost behind Les (5th from the left) was I am pretty sure Ray South. Where I lived in Newick Road, my back garden backed on to the South’s and the Bean’s back gardens, and was a quick short cut to the Wild Park - over my garden wall into theirs, down the path and round to the front of their houses, cross the Lewes Road, into the Park, saved at least 10 minutes. The only problem was if you were spotted by them. Happy days. Hi Martyn. Further to my last note, you mentioned CLB Badges. Re the boys who reached leaving age for JTC, many went on to the CLB as they were both linked. To get a good idea of these two clubs, I suggest you look in Wikipedia, enter ‘Church Lads Brigade’, lots of detail there. Hey Roy, right area and age group for my dad, Fred Burtenshaw. He had an older brother Jim (James) and two sisters. Does his name ring any bells? He turned 80 last week. Showed dad this pic, turns out he is in the pic, second row from front, second in from the left, light coloured jacket. Then he reeled off a lot of the boys names, he got a bit emotional about it, bless him. He said to ask if anyone remembered a Pop [cant remember other name]. Next time he visits i’ll get him to put names to faces. Oh by the way dad is Fred Burtenshaw [best dad in the world] he went on to have 5 daughters [Jackie, Lynda, Janice, Debbie and Sally-ann]. He was married for 49 years, then mum [Cath] passed away. I would love to hear if anyone remembers him, he was also the local chimney sweep. Hi Janice, I do well remember your Dad, I find it difficult to put names to faces so lets hope some more come forward. To have “Pop” mentioned was indeed a surprise, if it’s the same man. I think he was involved in the Moulsecoomb Boys’ Club, (one of the boxing trainers), and I think his name was Pop Brown. Perhaps your Dad can enlighten me on that one. Hi Roy, Dibley,after reading your comment to Janice about Pop, I am sure it’s Pop Baker. Yes, he was the boys’ club boxing trainer and he was very helpful.